Tell someone you've got a car which can hit 60 mph in under five and a half seconds, and then cannon itself on to a 165 mph top speed, and most people will think you've got either a top-end German saloon or a decent sports car stashed in the garage. 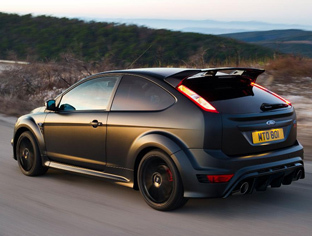 Most normal people won't jump to the conclusion that you're rocking a Ford Focus. There's good reason for that too, as there's only plans to produce 500 examples of the Focus RS500 - so it's going to be a rare sight. A damn sight rarer than the legions of fast Audis, BMWs and Mercs which seem to litter the motorways these days. 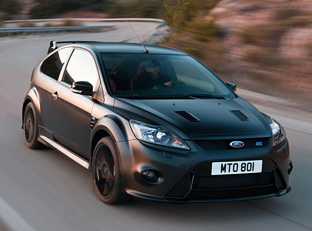 The Ford Focus RS500 isn't just a special edition with a fancy name and an extra badge either. Well it is that too, but it's also had some work done to the engine which boosts power output by a useful 15 percent over the standard Focus RS model. Power from the 2.5 litre, 5-cylinder turbocharged engine now stands at 345 horsepower @ 6,000 rpm and 460 Nm of torque from 2,500 - 4,500 rpm. The power increases come courtesy of a noticeably larger intercooler, a sports air filter, larger diameter exhaust downpipe, uprated fuel pump, and recalibrated engine software designed to optimise the performance of the new setup. "The engines improved breathing has allowed us to increase power without having to raise turbo boost pressure significantly," said Gunnar Herrmann, Fords global C-car vehicle line director. "This has made it possible to enhance peak performance while maintaining the excellent driveability, fuel consumption and emissions of the standard Focus RS." 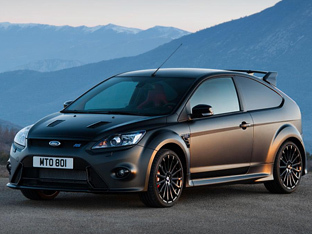 It certainly won't be hard to pick the Focus RS500 out from a lineup. 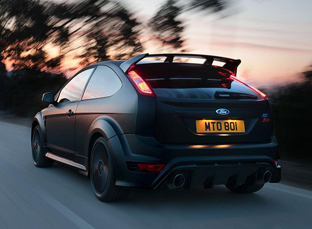 With it's matt black paintwork, black 19 inch wheels, red brake calipers the car gives off a fairly menacing attitude which almost makes the standard Focus RS look friendly! 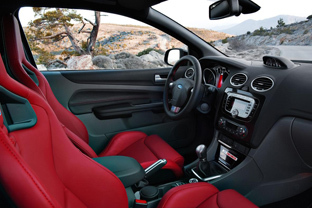 The inside of the Ford Focus RS500 also gets some special treatment. An individually numbered metal plaque on the center console identifies the car as being something just a little bit special, while red stitching on the steering wheel, door trim and gear lever gaiter complements the red Recaro sports seats.